A secret pro-tip that we just learned. The popcorn buckets allows you to get refills for only $1.50 for the length of your stay. That said, there is ONE place in all of the Orlando Parks that lets you refill with flavored popcorns. 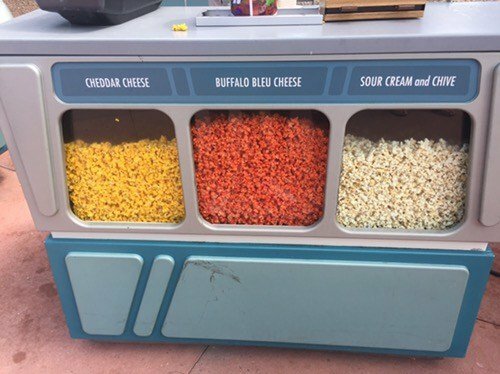 Located in Epcot Center between the Land and Imagination you can choose Cheddar Cheese, Buffalo Bleu Cheese or Sour Cream and Chive. Don’t mix them, that’s gross.